Just because the Tour Down Under is over, and the Classics haven't yet started, doesn't mean I don't have anything going on in the studio. I make art because I love to, and because I can't imagine doing anything else (with the possible exception of riding my bike). This is an 8"x10" piece of stained glass that I created for our grand daughter who should be born in the next couple of days. Her name is Alister Violet, so I thought creating an image of stars and violets was appropriate. The skull goes with the tattoos that adorn both of her parents. 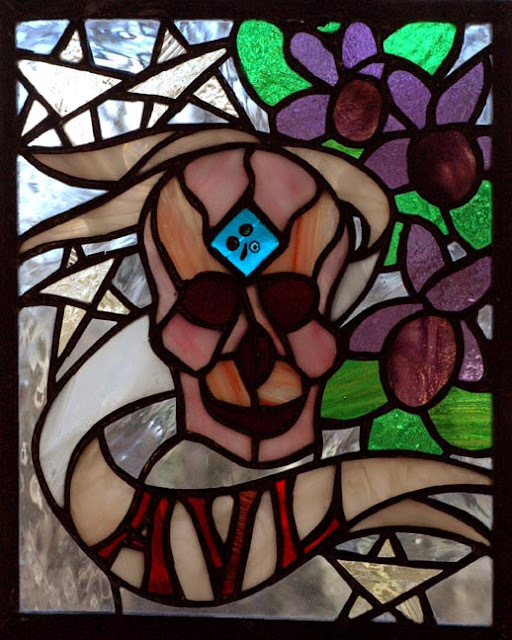 And I see the skull as a symbol of power and longevity. I'll be back in the studio tomorrow. And I'll be back painting cycling in March. It seems appropriate that the final stage of the Tour Down Under should come to a photo finish. With the over all race winner being determined by count back having finished on equal time, the final sprint should follow suit. It was a perfectly timed bike throw that gave the victory to Andre Greipel (Lotto Soudal). Caleb Ewan (Mitchelton-Scott) would have to take joy in one stage for himself and his teammates Tour win although a second place ain't bad. For Peter Sagan (Bora-Hansgrohe) his third place finish made the points jersey his own. It was a little odd seeing him out of the Rainbow Jersey, but then we have all gotten used to seeing him green during the Tour de France. All the way around this had been a very exciting Tour Down Under. This is a good omen for the coming Pro Tour season. I will now go back into my studio to work on other projects. 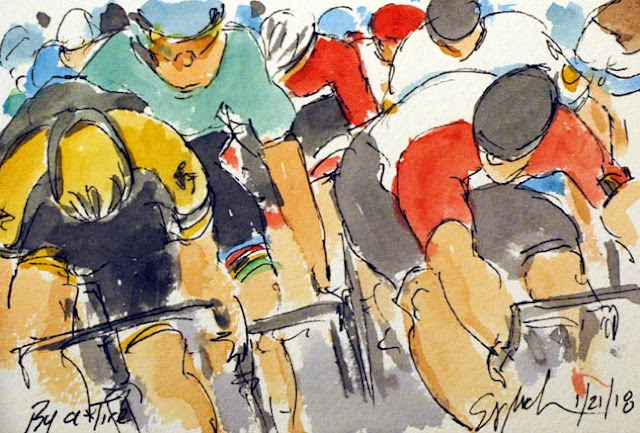 I will be back painting a selection of the Spring Classics as the season progresses. This is a small 4x6 inch original watercolor painting that is available through my artist website at www.greigleach.com created using Yarka St Petersburg watercolors from Richesonart.com. To purchase this artwork, just follow the direct link at the end of this post. And yes, international shipping is available. 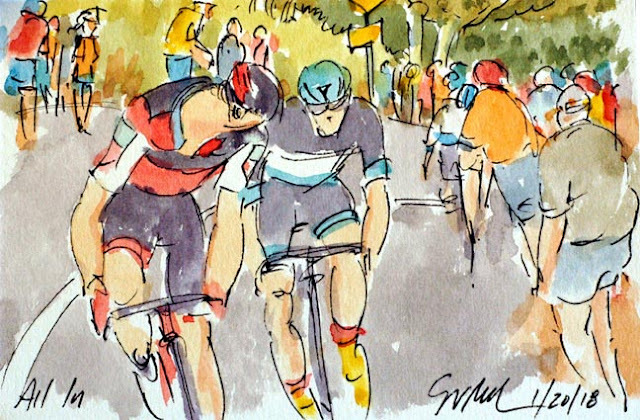 As the peloton got into the final two kilometers it seemed that all of the sprint teams lost control of the group at once. All of this Tour and surely all season long at this point it will be two or three teams all lined out with their sprinters tacked onto the end of the train. 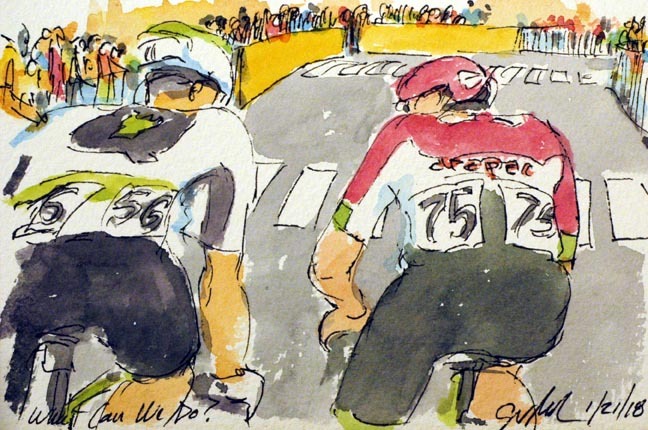 Today they was barely a pair of teammates together at the crest of the hill one and a half kilometers from the line. Cameron Meyer (Mitchelton-Scott) kept pushing on figuring his teammates who regain his wheel. He needed to deliver Caleb Ewan and his lead out man (and race leader) Daryl Impey onto the finishing straight. Every other leadout man was jumping around trying to get their men back together. At this point it was anyone's race, both for the stage and for the entire Tour. 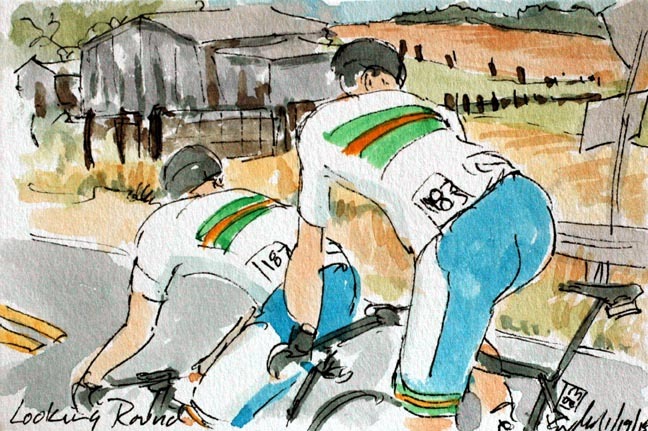 Tour Down Under, Stage 6: What Can We Do? Finally, it was this duo of Logan Owen (EF Education First-Drapac) and Ben O'Connor (Dimension Data) who got a solid lead on the peloton. Their two minute lead also meant that they sucked up all of the bonus seconds out on course all put ensuring that Daryl Impey (Mitchelton-Scott) would go out the over all winner of the 20th Tour Down Under. Owen appears to be asking O'Connor whether they should continue with the effort or admit defeat to the closing peloton. Or perhaps he was asking if the Dimension Data man had any power left in his legs, since Owen left on his own on the next lap. With the first couple of groups pulled back by the peloton, it was these three that seemed to be getting free on the streets of Adelaide. Truls Korsaeth (Astana), Laurent Didier (Trek-Segafredo) and Logan Owen (EF Education First-Drapac) were able to open up about a minute in the early laps of the downtown circuit. Question is... Will they be let off of the leash? With a very tight race in every competition except the King of the Mountains, today's circuit race through downtown Adelaide should be a "real ripper," to use the venacular. 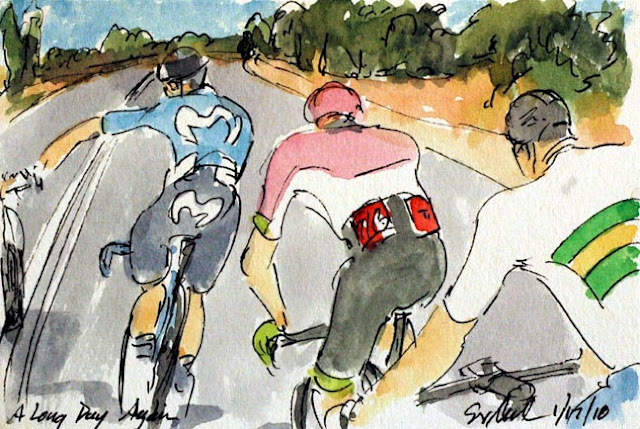 The first group to open up a gap on the peloton was this quartet comprised of Antoine Duchesne (FDJ), Nans Peters and Pierre Roger Latour (Ag2r La Mondiale) and Ben O'Connor (Dimension Data). 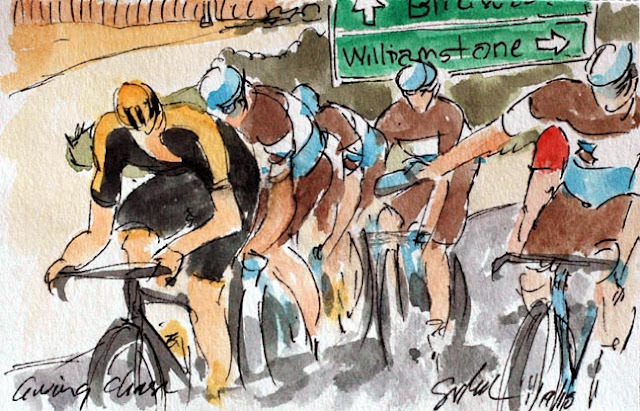 With bonus seconds on offer at the intermediate sprints, Mitchelton-Scott would love for a group to get established and help make sure that no one could grab time on the Ochre Jersey of their man Daryl Impey. Apparently after this group swelled in numbers, the peloton decided this was not the break they wanted. This is the view that every one in the peloton sees of Richie Porte (BMC) as he rides up the final ascent of Willunga Hill. Today he was racing for the Ochre Jersey, a slim chance at the Polka Dot Jersey, and to let everyone know that he has come back strong from the crash in the 2017 Tour de France. He took the stage by eight seconds over Daryl Impey (Michelton-Scott) and got a ten second bonus in the bargain, so it looked this the race lead might be his. However, with "count back" Impey had done just enough to secure the race lead for himself, and furthermore, he lost on count back for the Polka Dot Jersey as well. But he does claim this fifth win on top of Willunga Hill, much to the delight of the fans lining the final kilometer of the stage. 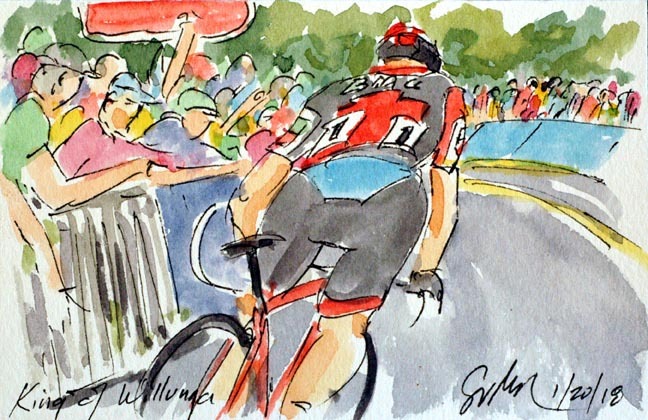 For five years running now, Richie Porte (BMC) has attacked at the exact same spot on Willunga Hill. And for five years, no one has been able to do much about it. Today, it was only Jay McCarthy (Bora-Hansgrohe) who could answer the savage acceleration by Porte. 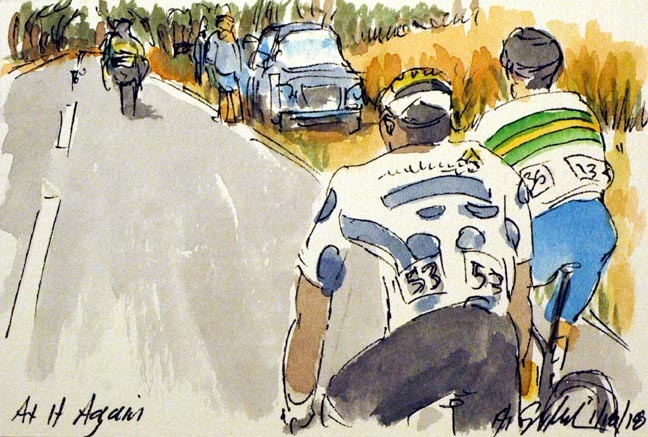 Just 20 meter behind, peeking around the corner, Egan Bernard (Sky) was trying to get back on terms with the two leaders. 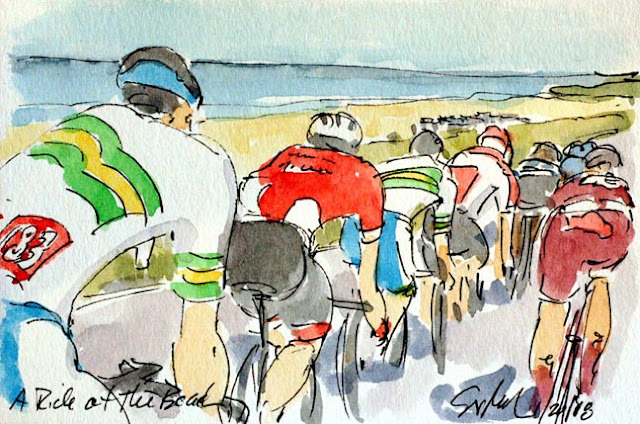 The rest of the peloton was scattered in twos and threes all over the 3 kilometers of Willunga Hill. As the break started up the penultimate climb of Willunga Hill (and of the day and the Tour Down Under), it was the leader of the King of the Mountains, Nicholas Dlamini (Dimension Data) that was battling it out for points with Thomas De Gendt (Lotto Soudal) and Scott Bowden (UniSA-Australia). The effort was being watched intently by the race commisare sticking his out through the roof of the following car. When I titled this piece I didn't know just how prophetic I was being. As they approached the banner that had marked the KOM points line in every previous stage, De Gendt motioned for Dlamini to go ahead and claim the points. After apparently giving Dlamini enough points to secure the jersey, De Gendt pressed on crossing the line at the top of the mountain (that would be the finishing line next time up) first. It turned out that was where the KOM points were awarded placing Dlamini second over the summit. It may not effect the final destination of the jersey, but it shouldn't have happened. A brief lapse of concentration sent Nuno Mates (Movistar) crashing to the ground as he road on the front of the small break away group. He was riding along the beach, so perhaps the scenery (or bathing suit clad woman) distracted him as he went around a corner. 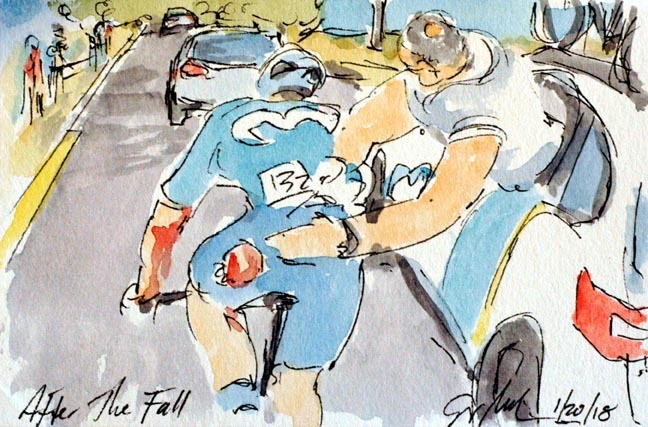 Unlike most any other sport, there is no time out, or injury delay in cycling. If he wanted to continue his Tour, he was going to have to get back up and manage the best he could despite the obvious cuts to his elbows and rear end. But get up he did. He was tended to by first his team car (here) and then the race medical team (while riding along at 40 kilometers an hour), all while joining back up with his erstwhile break away companions. We shall see if he is able to continue with the last stage in Adelaide tomorrow. After the heat of the last two days, the riders must have felt like today's stage was a ride in the park. Today it did feature a short ride at the beach along Snapper Point. 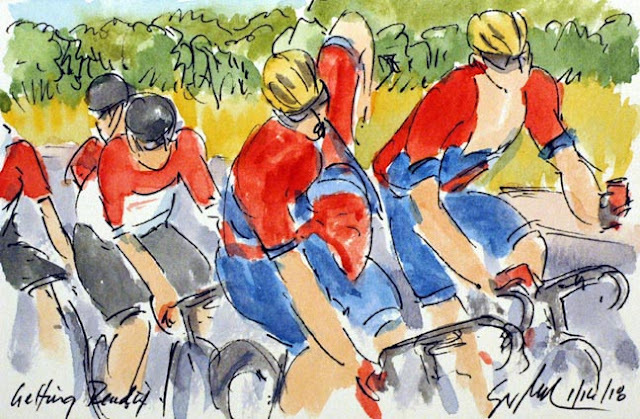 It was a big group that got away at the start of the stage, including some now familiar break away names. Riding on the back is the most aggressive rider from stage 4, Zakkari Dempster (UniSA-Australia), with his teammate, Scott Boweden - his third break away of the Tour. The new guys to join the group off the front were Fumijuki Beppu (Trek-Segafredo), Mads Wuirtz Schmidt (Katusha-Alpecin) and Thomas De Gendt (Lotto Soudal). The seventh member of the break, although you can't really see him, is the leader of the King of the Mountains Competition, Nicholas Dlamini (Dimension Data). 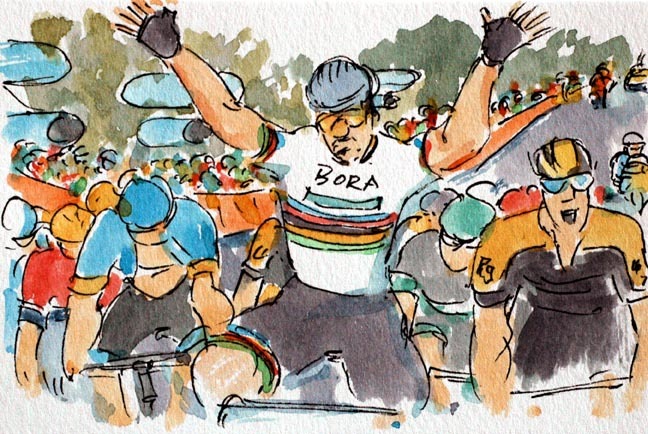 Few will argue that Peter Sagan (Bora-Hansgrohe) is a super man when it comes to cycling. 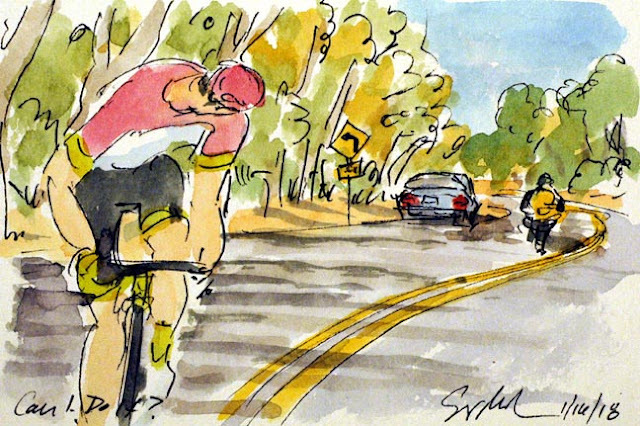 Sagan had gone on the attack on the descent with about three kilometers left to go. He was pulled back by several different teams including BMC, Astana and Mitchelton-Scott. Not to be deterred, he caught his breath, took a drink and got ready to go again. Daryl Impey (Mitchelton-Scott) launched his sprint first, but was caught by the three time UCI Road World Champion. Luis Leon Sanchez (Astana) rounded out the top three. It was Sagan's teammate, Jay McCarthy claiming fifth on the day. Sagan's sprint was enough to put him in the Ochre Jersey of race leader by just two seconds over Impey. I was amused to notice that I had forgot to sign and title this piece. 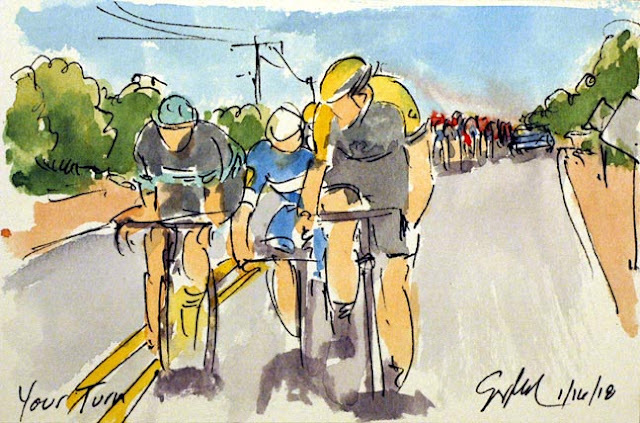 When I painted the Richmond 2015 UCI Road World Championships, live in downtown Richmond, I had gotten caught up in the moment of Sagan's win and not signed his victory salute painting. So it is fitting that I didn't sign his first win of the 2018 Pro Tour season calender. My website is down for matainence, so I will post links later. In the mean time, if you really want this painting, just email me at greigsart@gmail.com. 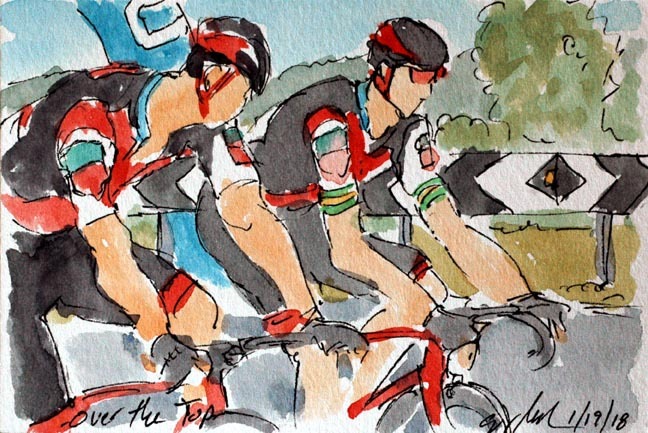 Today was the first day I have seen Team BMC on the front of the peloton. 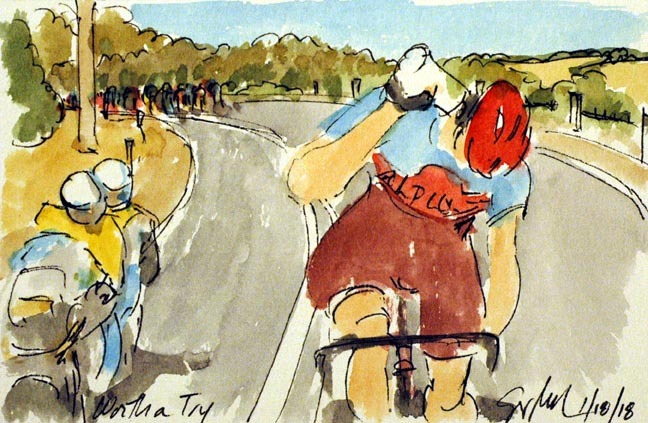 They hit the front on the base of the climb up to Norton Summit with Miles Scotson. At the top it was Richie Porte jumping out to grab the KOM points after the work of Simon Gerrans. However, he just missed getting around his teammate, so it was Gerrans with maximum points, and Porte taking second over the top. Niether gained enough points to take over the lead in the King of the Mountains competition so perhaps "no harm, no foul." Now it was just seven kilometers of rollers for the stage victory. 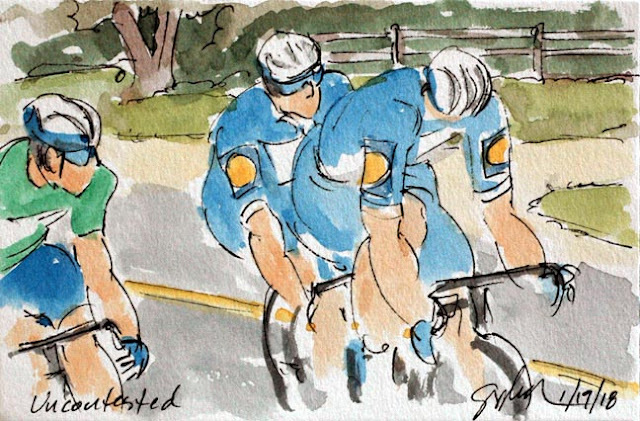 With his teammate (and former breakaway companion) having done all he could, Zakkari Dempster (UniSA-Australia) pressed on in a solo effort to hold off the peloton. Alas, with 19 kilometers left in the day, it was the peloton spread across the road that he saw looking back. The break rarely succeeds, but it is always a risk worth taking. He will be on the podium to take the "most aggressive rider" award. Now the question is, will he be able to hold onto the tail of the fast moving peloton. Spoiler: He could not. This duo of Zakkari Dempster and Alexander Porter, both riding for UniSA-Australia, had built up a lead of nearly ten minutes. 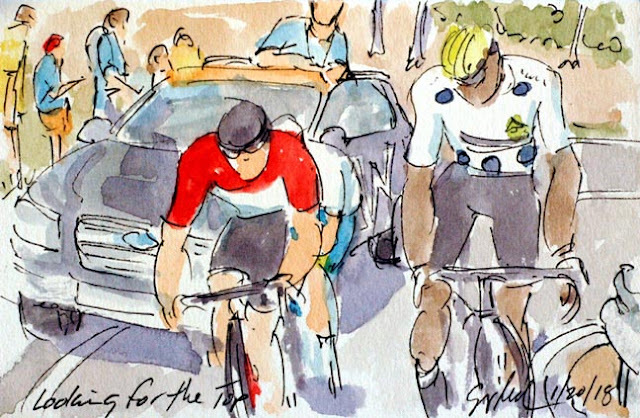 With 50 kilometers left to race they had seen their lead cut in half, but there was still some room for hope. The usual rule of thumb is that the peloton can pull back a minute every ten kilometers assuming there isn't a climb before the line. Unfortunately for these two, Norton Summit stood between them and the finish in Campbelltown. 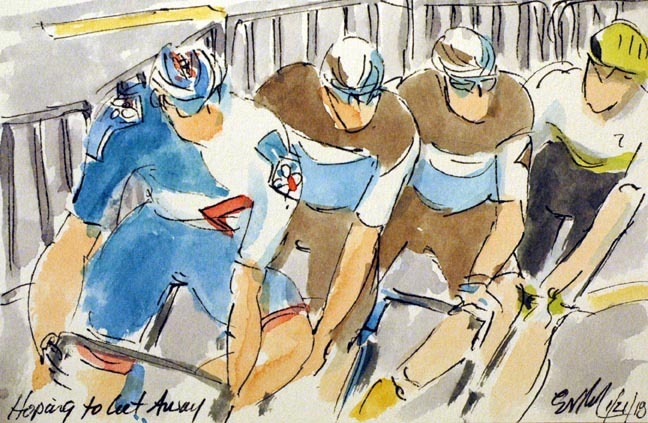 On the other hand, when the break is two teammates, there is true cooperation in hopes that one will claim the stage. Having sprinted hard to take the first intermediate sprint of the day, Elia Viviani (Quick Step) and his teammates were surprised the second sprint was uncontested. Admittedly, they were sprinting for a one second bonus and just a point towards the green jersey. With his second third place on the day, Viviani claimed the outright right to wear the sprinter's jersey that he started the day wearing it on loan. Of course, that may depend on who takes the stage at the end of the day. With a seven kilometer climb just before the finish in Campbelltown, it is unlikely that any sprinters will be taking the stage. With the break building up just shy of ten minutes on the peloton, it fell to Jack Bauer (Mitchelton-Scott) to drive up the pace and give chase. He was experiencing the down side of having the Ochre Jersey on the shoulders of a teammate. Behind him was most of Ag2r La Mondiale. Each teammate will make sure his compatriots are top up with water and food. With the continued heat of South Australia, the organization started the stage an hour early in hopes of avoiding the worst of the heat. With temps over 105 degrees, I hate to think what the heat of the day might be. It appeared that Caleb Ewan (Mitchelton-Scott) and his team out smarted themselves. As their train came to the line, Ewan and his leadout man, Alexander Edmondson, had opened a gap on the rest of the field. It appeared that Ewan decided that the gap was enough that he could let Edmondson take the victory (a thank you to his hard work for the team and himself). 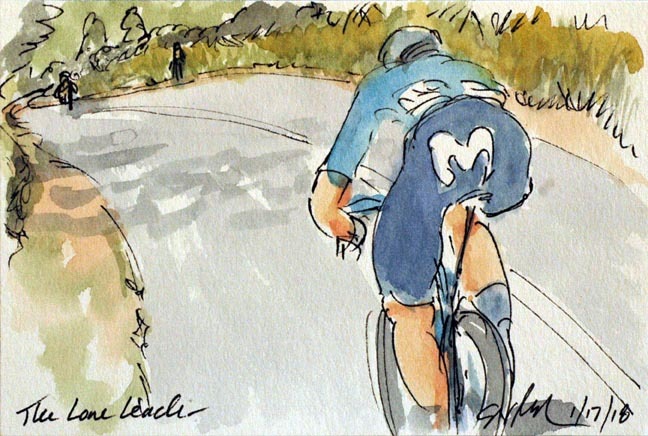 What he didn't see when he looked both left and right, was the fast closing Elia Vivianni (Quick Step). Once Ewan saw is error, he just wasn't able to wind his sprint up, to the full gas Viviani was applying. 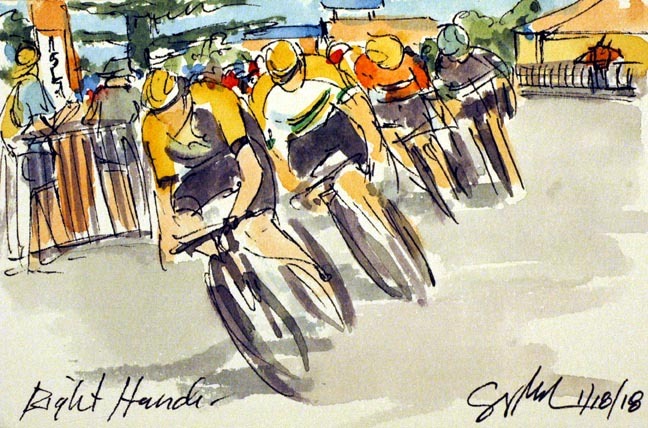 Out of the edge of this painting, Phil Bauhaus (Sunweb) got aroung the Ochre Jersey of Ewan as well. Viviani played it perfectly, and got to salute the crowd in true sprinter fashion. Mitchelton-Scott seemed to have it all in hand as they hit the right and then left turns that led into the final meters of the race into Victor Harbour. As we have seen, it was Daryl Impey playing pilot fish for the Australian national champion, Alexander Edmondson and the Ochre Jersey clad Caleb Ewan. 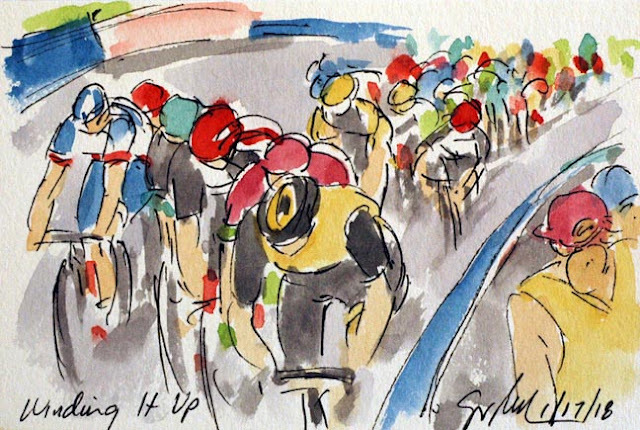 Behind the Mitchelton-Scott train, all ot the other sprinter's and teams were trying to see if they had a chance of disrupting the seemingly inevitable second stage win by Ewan. Tiago Machado (Katusha-Alpecin) put in a strong attack on the final lap around Victor Harbor. The race had been shortened by 26 kilometers (2 circuit laps) due to the excessive heat - temperatures were in the 115 degree range. Machado was doing his best to keep cool, pouring water over his body in a vain effort to chill himself down. The late break away was an equally vain effort. 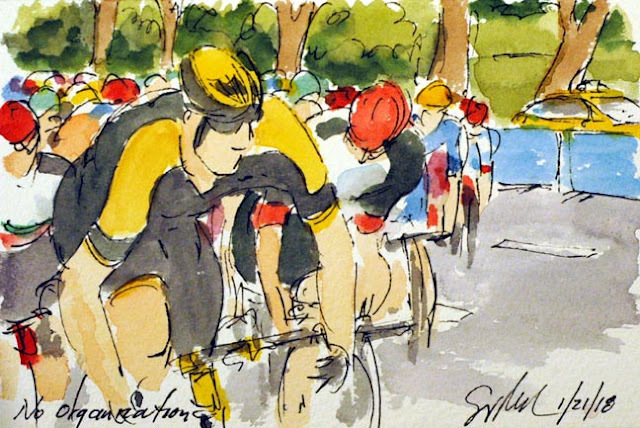 Often when a rider goes on the attack, he is hoping that others will jump onto his wheel. When no one comes along, the lone attacker is faced with the hard decision of pressing on, or just sitting up. Machado decided to press on despite the odds of success. I do enjoy a pun, I am a dad after all. I am also about to be a grandfather, so that makes puns doubly fun. So... Nathan Haas (Katusha-Alpecin) and Jay McCarthy (Bora-Hansgrohe) sprinted for bonus seconds and for second place at the intermediate sprint point. Haas was able to hold of McCarthy for a 2 second bonus, McCarthy got a 1 second bonus. Seems like quite a bit of energy for very little gain. However, the Tour Down Under has been decided by just one second in the past. And this duo finished 2017 on equal time with count back putting one on the podium and the other in the less than satisfying fourth place. The duo of Scott Bowden (UniSA-Australia) and Nicholas Dlamini (Dimension Data) went off the front of the peloton at the first kilometer for the third day running. Dlamini was searching for more King of the Mountain points to further secure his Subaru KOM polka dot jersey. Bowden was proving that the non Pro Tour team has every right to be in the Tour Down Under, and that they can light up the race. Once Dlamini had claimed maximum points he quickly dropped back into the fold. With the excessive heat even the South African saw no reason to work any harder than necessary. Every commentator, and most teammates, didn't think Caleb Ewan (Mitchelton-Scott) had a chance of taking the stage up to Stirling. They were wrong. And Ewan was followed across the line by his teammate, Daryl Impey. Third place was taken by Jay McCarthy (Bora-Hansgrohe), who was aided by none other than his teammate, the UCI Road World Champion, Peter Sagan. Sagn finished the day in fourth. In winning the stage, Ewan also pulls on the Ochre Jersey of race leader. Sagan's finish was enough to move him into second overall. Unfortunately for the virtual Ochre Jersey of William Clarke (EF Education First-Drapac) the positions of Ewan and Sagan, leave Clarke in third overall. 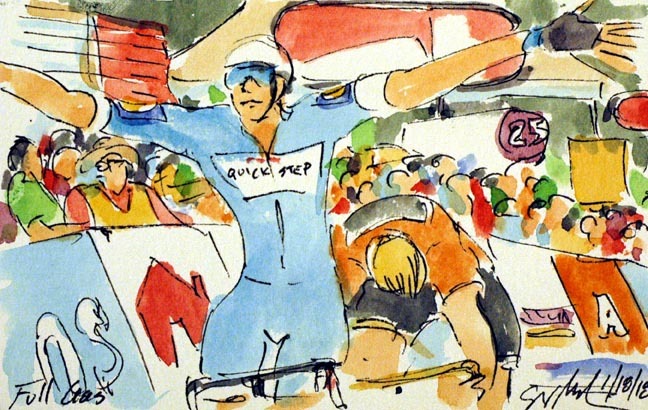 I suspect we will seem him in the break again tomorrow. Having gone under the red kite marking the final kilometer of the stage, it was time to wind up the uphill sprint. Robert Gesnik (Lotto NL Jumbo) led the peloton around the final bend with just 500 meters to go. 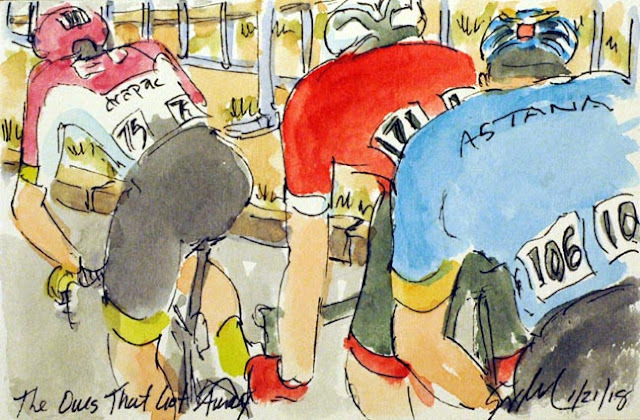 Two of those tucked onto his wheel were Rui Costa (UAE United Emirates) and Jay McCarthy (Bora-Hansgrohe). Sorry that I wasn't able to get the names of the EF Education First-Drapac and FDJ riders. A little futher back are Daryl Impey and Caleb Ewan (Mitchelton-Scott) trying to make sure a gap doesn't open up. This is a small 4x6 inch original watercolor painting that is available through my artist website at www.greigleach.com To purchase this artwork, just follow the direct link at the end of this post. And yes, international shipping is available. The peloton pulled back in the final break away rider with about 14 kilometers left to race. Now it was time to play a game of rolling chess. With the bonus seconds William Clarke (EF Education First-Drapac) had won early in the stage, if the three podium finishers did not place, or Clarke took the stage, he would pull on the next Ochre Jersey of the 2018 Tour Down Under. So it was that Mitchell Docker and two other members of Clarke's team hit the front with just seven kilometers of climbing left to go to the finish. Keeping an eye on the pink clad train were, Elia Viviani (Quick Step) and Maciej Bodnar (Bora-Hansgrohe). It should be noted that Andre Greipel (Lotto Soudal) had lost contact with the peloton, but the other two from Stage 1, Peter Sagan (Bora-Hansgrohe) and Caleb Ewan (Mitchelton-Scott) were just behind this leading group. 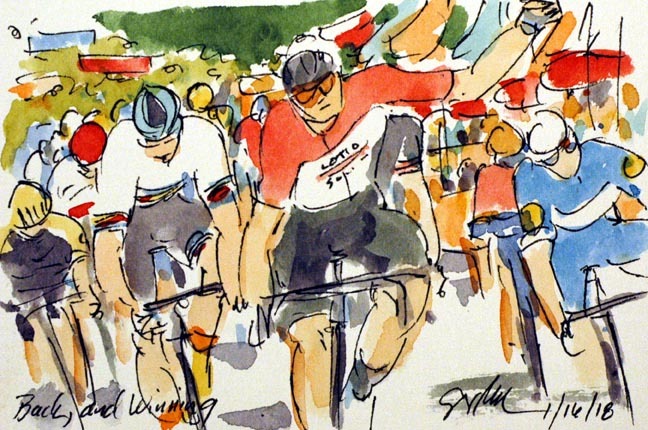 Once the final sprint points on the stage were taken by William Clarke (EF Education First-Drapac), only Jaime Castrillo (Movistar) pressed on with the break away. The trio had built up a six minute lead, but with the hilly circuit around Stirling, it would be a tall order for Castrillo to hold off an eager peloton. On the other hand, Castrillo is the former under 23 time trial national champion of Spain. Conversely, he still has 51 kilometers to defend his solo lead. Stage 2 of the Tour Down Under was marked by yet another break away. 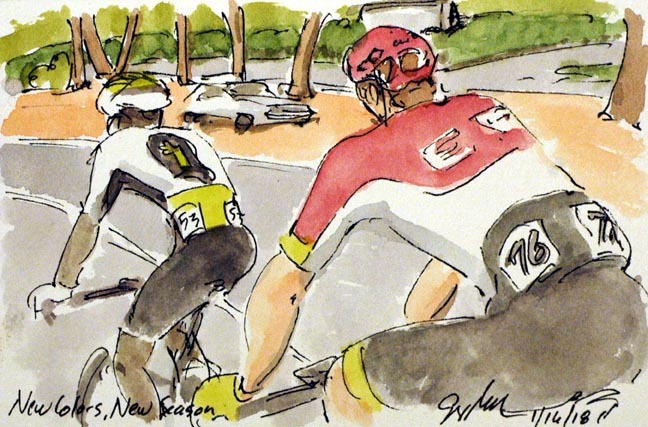 Earlier (before TV coverage started) Nicholas Dlamini (Dimension Data) was with these three, but once he had grabbed the King of the Mountain points he dropped back the the peloton. Sporting the red numbers of "most combative rider," William Clarke (EF Education First-Drapac) was on the attack again. He was joined by his countryman, Scott Bowden (UniSA-Australia) and another first year pro, Jamie Castrillo (Movistar). I was rather surprised at the change in Movistar's kit for 2018, please, but surprised. 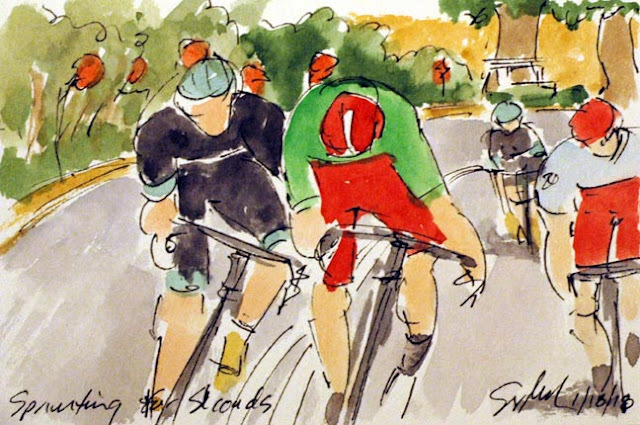 It was Andre Greipel (Lotto Soudal) who punched the air in victory at the line in Lyndoch. It has been a few years since the "Gorilla" has may the trip to Austraila for the opening tour of the season, but he now has 17 stage victories over his career on the streets of South Australia. Closing quickly was the three time World Champion, Peter Sagan (Bora-Hansgrohe), but he couldn't quite get around Caleb Ewan (Michelton-Scott). 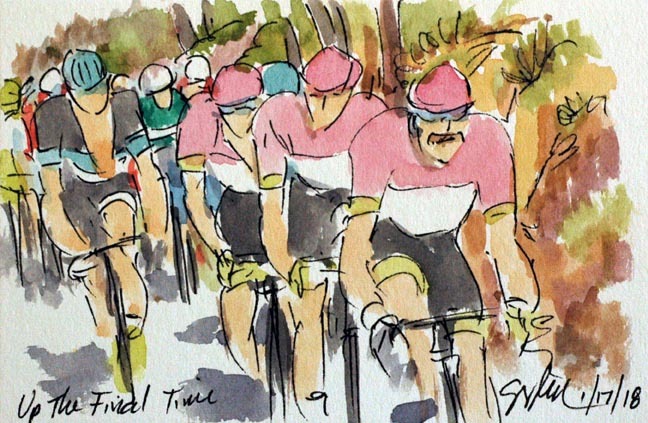 So tomorrow, Greipel will start the day in the Ochre Jersey of race leader with Ewan, Sagan and Elia Viviani (Quick Step) nipping at his heals. 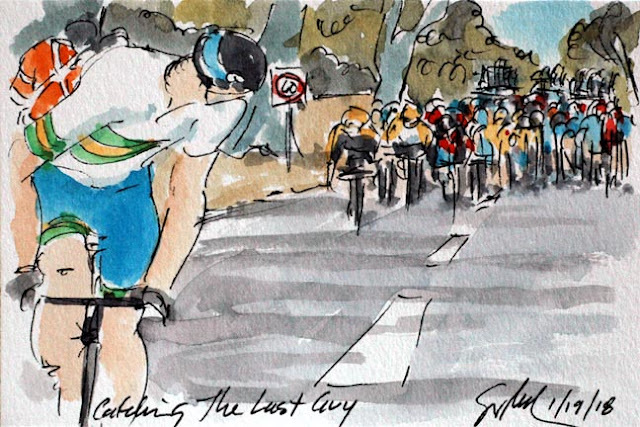 Tour Down Under, Stage 1: Can I Do It? Looking over his shoulder with just 12 K left to race, William Clarke (EF Education First-Drapac) must have been pleased to see an empty road. Clarke had been off the front since kilometer three, making it a 130 kilometer effort at this point with nearly 30 kilometers on his own. Clarke is a very capable time trialist, but this was going to take a Herculean effort. Sprinters don't take lightly to having the plans spoiled by a break away. Another new team, formerly Orica-Scott, is now racing under the name Michelton Scott. The job of pulling back the lone leader fell to the Australian (on the Australian team), Damien Howson. At this point, with just 15 kilometers left on the day, Howson swung off to let Maciej Bodnar (Bora Hansgrohe) have a turn. Waiting on his wheel is Eros Capecchi (Quickstep) ready to do his part to get his sprinter in a position to take the stage. With the peloton closing in on the lone leader, it was time to get ready for the finale. Admittedly, it was still another 49 kilometers to the final line in Lyndoch, but preparations must be made. Ramunas Navardouskas (Bahrain Merida) made sure his sprinter, Domenico Pozzovivo, had enough to eat out of the musette. He on the other hand seemed to be taking energy from a small can of Coke, while trying to stay as cool as possible in the heat of the Australian summer. Tucked onto the wheels of Bahrain Merida, were the newly kitted men of Lotto Soudal. 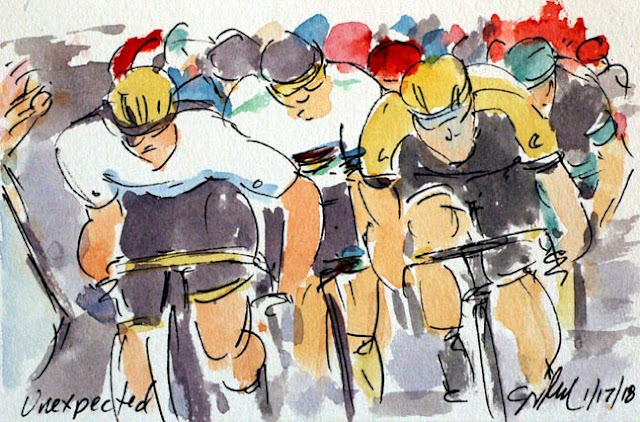 There are many reasons to love the Tour Down Under, many indeed. One is a chance to see the new kits (and new team names) for the start of the World Tour season. One of the newly named teams, and one that almost went belly up, is EF Education First - Drapac, once known as Cannondale - Drapac. I must say I am happy to see some bright pink back in the peloton. Showning of the colors is William Clarke, one of a two man early break that included neophyte, Nicholas Dlamini (Dimension Data). Dlamini claimed the only mountain points on the opening stage, so his break away efforts paid big dividends. The duo built up a 4 minute advantage, but the peloton was seeing the ride into Lyndoch as a day for the sprinters.